It took two years from the initial concept to the last snap in January 2011 to complete G-Woman. The idea or inspiration came by way of the Great Recession and concerns that the crime rate would increase. It got me thinking about the Great Depression in the 1930s’ when crime was rampant and heroes and anti-heroes emerged in a very public way. 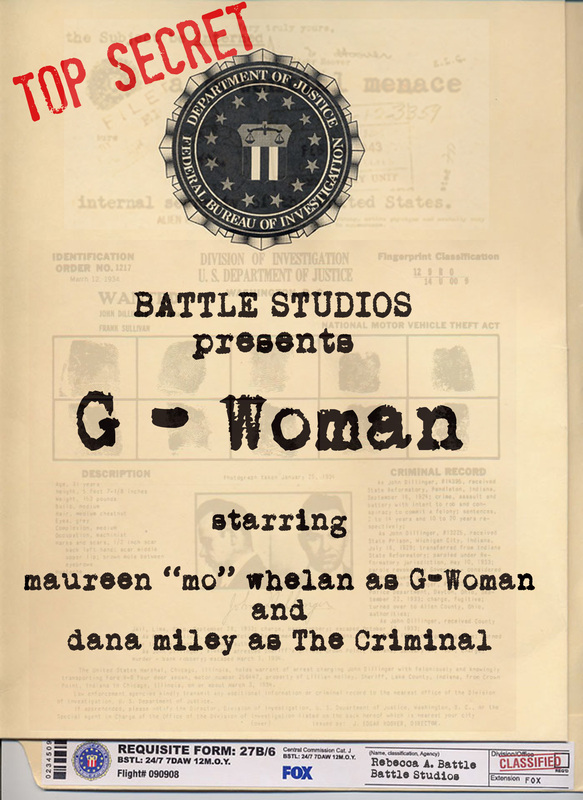 Having worked with Maureen “Mo” Whelan before I thought it would be fun to cast her as G-Woman, even though I think she would have preferred to be the gangster. She was a good sport about it and well the photos speak for themselves. It was her idea that the photoplay would make a good comic book and what a good idea that was! This was Dana Miley’s first project and first time holding a weapon and was a natural fit as The Criminal. His father rebuilds automobiles and gave Dana a customized Plymouth International truck that made the perfect companion as G-Woman’s truck The Black Bomber. And so everything fell into place perfectly. Thank you Mo and Dana…..and the Black Bomber. Rebecca A. Battle is a conceptual, industrial, urban and American photographer. She applies a film professional background to create original photoplays, editorials, and photographic shorts utilizing her surroundings as ready-made set design to visually tell a story. Her work also brings attention to the mundane or abandoned by documenting the erosion of urban and rural America. The monographs suggest a sudden occurrence annihilated life with hardly a trace of human activity. By combining a film industry background and photography, she creates original concepts and photoplays, and takes advantage of documenting real life stories that unfold in life. For instance, G-Woman is a photoplay about an FBI agent hunting down a criminal in the 1930s’. Or in the case of Board she spent enough time at Venice Skateboard Park to document little stories amongst the skaters. During her career as a film professional in Los Angeles, Battle has worked in every genre and medium of filmmaking and is a classically trained pianist. She attended the liberal arts college Wilkes-University in Pennsylvania. You can follow her gallery of work and photographic adventures at http://www.battle-studios.com.